Huw J Williams Features, interviews, news, films, audio and copywriting; all engaging, always accurate. ”] It’s been two hundred years since a young Swiss explorer, Johann Ludwig Burckhardt, discovered for the western world one of the greatest treasures of antiquity – Petra. The capital of the Nabataean kingdom between 400BC and AD106, the ancient city carved into pink sandstone cliffs lay hidden at the end of a twisting, river-cut canyon in the Jordanian desert. While this Unesco world heritage site is probably Jordan’s most famous tourist destination, there are a number of places travellers should visit in this enchanting Middle Eastern country. 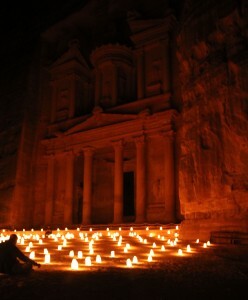 Make your first visit to Petra at night, when the Siq, a kilometre-long canyon and entrance to the ancient city, is lined with more than a thousand candles. 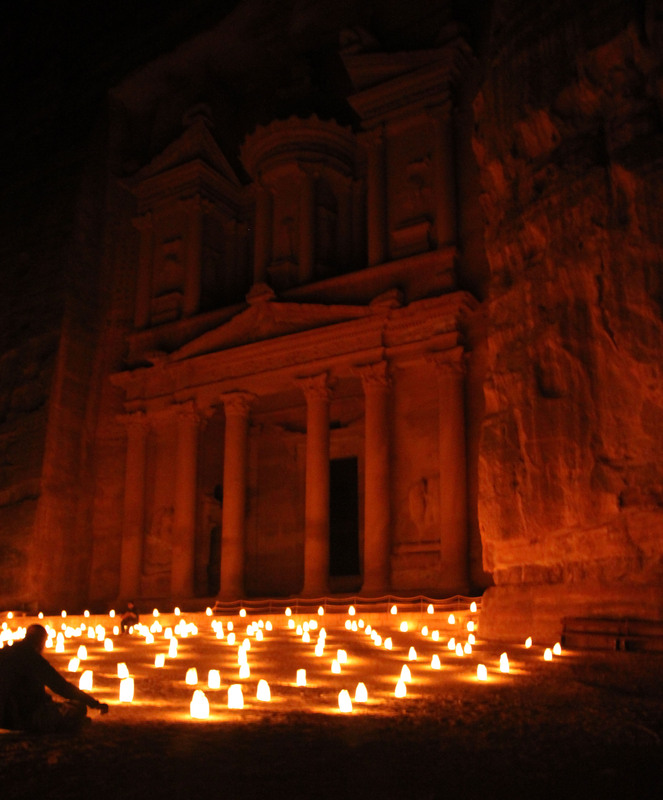 Walk this narrow gorge as flickering flames cast shadows on the rocks, then round the final corner to see al-Khazneh (the most elaborate ruin, known as the Treasury) bathed in candlelight: a truly awe-inspiring sight. Return the next morning and, in daylight, the natural beauty of the Siq’s rock patterns are revealed, as are the intricacies of the tombs, frescoes and facades. During the day the entire site of Petra is open for exploration: check out more than 500 rock-cut tombs, high cliffs, temples, a Roman theatre, sacrificial altars and stunning views across the canyon and the surrounding hills. Often overlooked yet well worth visiting is Siq al-Barid, also known as Little Petra, a canyon three miles from Petra which has its own rock dwellings and Nabataean wall paintings. The capital of Jordan is a hotbed of modern Arabic culture – a vibrant meeting place of east and west. Nestled on steeply sloping hills, it has a laid-back atmosphere and can seem more like a collection of small neighbourhoods than a major city. Exploring the safe and welcoming streets by foot is the best way to experience this friendly city. The bohemian artery of the city is Rainbow Street, running along the crest of Jabal Amman and lined with funky bars, restaurants and cafes. On the hill opposite is Amman’s artists’ district, Jabal Weibdeh. Its aesthetic heart is Darat al-Funun, a charming collection of galleries in old stone buildings set amid gardens. Descend from these lofty communities to explore al-Balad, Amman’s bustling downtown of souks, shops, street vendors, Roman ruins, mosques and museums. Wadi Rum, in the south of Jordan, is a desert landscape of austere yet majestic beauty. Huge monoliths soar skyward, each has been wind-sculpted over millennia, and are interspersed across a plain of red and pink sand and gravel flats. Carved into the cliffs are ancient rock art – pictures of hunting scenes and animals. The Bedouin call this “the Valley of the Moon” and this 720 sq km reserve is certainly otherworldly: its beauty and scale are both captivating and daunting. As impressive as it is on the ground, it is even more spectacular from the air. If you have a head for heights, hot-air balloon rides across Wadi Rum, available through the Royal Aero Club of Jordan in Aqaba, offer an unforgettable experience. The Dead Sea is at the Earth’s lowest elevation, about 400 metres below sea level. It’s highly salty water contains strong concentrations of magnesium, chlorine, potassium and bromine, with many claimed medicinal properties. Floating on the surface of its waters is a strange yet relaxing experience. Beware if you have any small cuts on your skin – they will sting. For adventurous types, a vivid counterpoint to the Dead Sea’s tranquil environment is to hike, wade and scramble up the Mujib river canyon nature reserve that empties fresh water into the salty sea. The clear waters flowing through this snaking, sheer-walled gorge are teeming with crabs, fish and frogs. Wild mint, wild fig, oleander and other lush vegetation fringe the banks and birds fly from cliff to cliff. Dana is Jordan’s largest nature reserve: a place of stunning beauty, a vital wildlife haven of international importance and a home to human communities for more than 6,000 years. From the high cliffs of the Great Rift valley, its territory falls 1,700 metres to the desert of Wadi Araba, passing through four distinct ecozones that give Dana its incredibly diverse wealth of plant, animal and bird life. Perched like an eyrie on a cliff edge is Dana village – a settlement of stone buildings where freshwater springs feed small terraced gardens of fruit trees and herbs. The Jordanian Royal Society for Nature Conservation has established craft and ecotourism projects to breathe new life into the community. It also offers guided walks through the village, up into the cliffs and down through the meandering paths of the valley to the desert below. Jordan’s coast is only 27km long, but it boasts more than 20 dive sites between Aqaba and the Saudi Arabian border. Most of them are close to shore, on the fringing coral reef, populated with plentiful shoals of colourful reef fish and occasionally visited by green turtles that come to feed on the seagrass. There are also two wrecks, sunk to form artificial reefs. The Cedar Pride lies between 10 and 28 metres so is a good dive for both open water and advanced divers, while the second is an unusual sight on the seabed – a military tank that used to belong to the Jordanian army. If you would like to commission me to write articles, ghost write your blog, provide custom copy for your company, or if you want to discuss video, audio or stills projects, please get in touch. © 2019 Huw J Williams. All Rights Reserved.